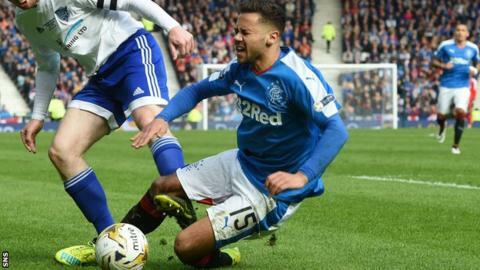 Rangers winger Harry Forrester has signed a new three-year contract which will keep him at the club until 2019. The 25-year-old arrived from Doncaster at the end of December on an initial six-month deal, and has scored five goals in his 16 games since. "The aim was to be here longer than the six months, so I'm really happy to get it over the line," he told Rangers TV. "I love it here, and playing at Ibrox. There are good times ahead at this club and I want to be part of that." Forrester was taken off injured in Rangers' Petrofac Training Cup final win over Peterhead, but insisted he was "totally fine" for Sunday's Scottish Cup semi-final with Celtic. And he is confident Rangers can cause problems for the Premiership leaders at Hampden. Forrester gave Rangers the lead after 13 seconds in their 4-0 quarter-final victory against Dundee. And he said: "We got off to a flying start and it was against Premiership opposition. That gave us belief that we can mix it up there with the league above and we believe we can get something out the game. "We believe in the dressing room. We talk day in, day out. We have to keep improving but it's a good test for us on Sunday."